Despite warnings of drug-fueled violence and kidnappings, I hedged my bets and set off on a Mexican “spring break”. I got my fill of Cancun-bound, sweatpant-clad college sophomores on the plane and b-lined to Leon, grabbed a car and, within a couple hours, was rolling up the sunny hills of San Miguel de Allende. 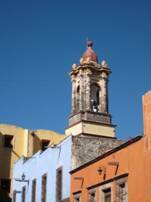 My snapshots above illustrate the vibrant color palate of San Miguel. 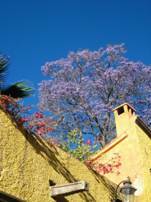 The city is picturesque – cobblestone streets, classic colonial architecture (even the dilapidated buildings are artful), elaborate iron gates and heavily detailed wooden doors opening onto private garden courtyards, a very grand Parroquia and everywhere you look…purple jacaranda and dazzling shades of bougainvillea. I could go on and on about this artsy, elegant hideaway and how much I yearn for a return, however instead I offer a quick guide below to entice others. You’ll notice there is no “where to eat” below. That’s because I didn’t have a bad meal during my stay. San Miguel is renowned as the best “small town” dining in Mexico. Explore to find a spot you love. Remember, 15 pesos = $1 – talk about an easy way to shelve any recessionary blues! • Visit the hot springs. If you’re seeking some waterside leisure head to any of the well known springs, approx. 10 min drive outside town. Grottos, pools and gardens! • Jardin Botanico – think succulents – go at sunset. • San Miguel is a very arts-driven community. Check out the local galleries and series of arts events. • Visit the Aurora Design Center – designer and artisanal furnishings abound. The complex is full of incredible galleries, jewelry and crafts shops. • Visit the Insituto – a market brimming with locally-made goods. I picked up a gorgeous Oaxacan rug at a steal. Best gift shopping in town.